Manorama, actor, comedian and singer affectionately known as 'Aachi', died of multiple organ failure in Chennai on Saturday night (Oct 10). She was 78 and is survived by her son Boopathy. Manorama has acted with veterans and legends like Anna Durai, M G Ramachandran, M Karunanidhi, N T Rama Rao, Sivaji Ganesan, Nagesh, Cho, Thengai Srinivasan and the present day actors including Rajinikanth, Kamal Haasan, Vijayakanth, Sarath Kumar, Sathyaraj, Vijay, Ajith, Suriya and Vikram have shared screen space with Manorama and they have a great respect for the actress. She had known me as a three-year-old child actor. A loving woman and a great performer. I would say that she and Nagesh are the mummy and daddy of Tamil cinema comedy. I am honoured that they both admired my work, commented on it and cheered me on. Bye bye my loving, funny mamma. -- Kamal Haasan. Aachi Manorama's death comes as a shock to all of us. I was talking to her yesterday evening and she said that she will participate in the event related to Nadigar Sangam elections. Within a few hours, I got the news that she is no more. It is a great loss to the film industry. --Sarath Kumar. Her contribution to the film industry is immense. While her achievements — she has acted in more than 5000 stage plays and 1200 movies apart from netting several film awards and receiving Padma Sri — are many, she remained a simple, humble human being. --Vijayakant, DMDK leader. Original Name: Gopishantha and Place of Birth: Mannargudi. First film: Malaiyitta Mangai (1958). Important films: Bommalattam (1967); Thillana Mohanambal (1968); Karunthel Kannayiram (1971 Duet wit S.P.B); Mr. Sampath (1972, directed by Cho); Pattikada Pattanama (1972, Madurai dialect); Unnal Mudiyim Thambi (1988). 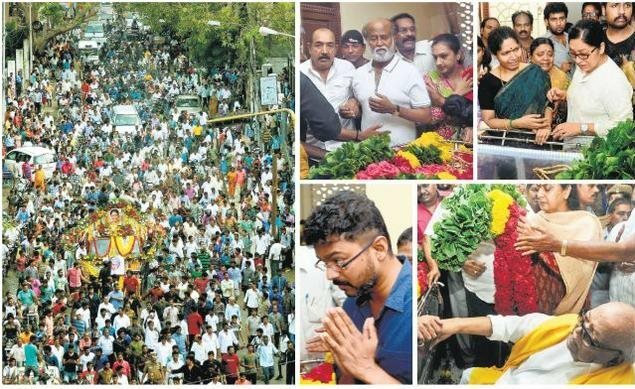 Tamil film celebrities took to their twitter handle to pay their condolence message. Radikaa Sarathkumar: What a great loss manorama Aachi passed away . RIP to a great person So many memories, time shared, great laughs spoke to her yesterday. Thoughts running across my head, so shocked. Just going to her place. Khushbu: A sad day in the history of tamil cinema..1 of the greatest actor #MANORAMA fondly known as #AACHI is no more with us..a legend has left us. A vacuum will remain forever..nobody can ever replace her.. So many memories I have wid AACHI..all will remain close to my heart forever.. RIP Aachi ma..
Siddharth: Rest in peace Manorama aachi. One of the greatest ever. Lakshmi Manchu: #manorama no more? Cinema has lost an icon. RIP my dear. Thankq for your work. I grew up w her magic. What an amazing actress. Trisha: Rip aachi was an honour n privilege to have worked with u n known u as 1 of d most humble n wonderful human beings. Sridevi: I am one of the fortunate ones to have worked with the legendary #Manorama. A wonderful human being. We will miss you Aachi. Tamannaah: Manorama aachi will continue to live on in our hearts, my heartfelt condolences to her family, may her soul rest in peace. Vidyulla Raman: Unable to accept this news.. Aachi Manorama...A legend has left us. You will always continue to inspire me every single day. wish I met you You will continue to be my mentor from heaven.. Even if I achieve 10% of your accomplishments I will be happy. Love you Aachi. Priyamani: Oh no!!! !one of the few ladies I really admire and love as an actor and as a lady...Manorama aachi has left us...:(will miss u aachi!